I’ve already posted a monthly update here but would like to provide a 2012 yearly update as well. I started this blog in March of 2012 and that is basically when I started following a DG strategy. I built up my portfolio from a value of $34,000 in April to a value of over $94,000 today. Some of this was due to share price appreciation but mostly was due to new purchaes. These are unrealized gains and the whole point of my DG strategy is to receive increasing dividend income so the only position I may sell is BBVA as it’s more speculative. I plan to hold WAG long-term. Neither of these were mentioned on my blog because I had a separate portfolio with a different broker that I was calling my “income” portfolio. It’s now combined together. However I sold both of these positions at the end of the year to claim the tax writeoffs. I might buy them back after 30 days to avoid the wash sale rule. At this point EXC is purely a value play. I only had 1 losing trade out of 21 trades for a profit of $2719 before commissions. I already posted a full yearly review of my options trades. You can find that post here. My total for the year was $1791.55. 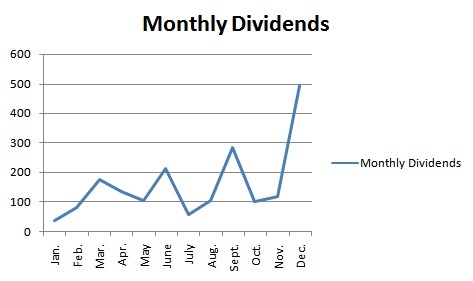 My expected future 12 months of dividend income has increased to $3954.05. I’ve updated my dividend income on my Dividends tab. Here is what my dividend income and future projections look like. I like how much smoother the graph is of the projected future 12-month income. 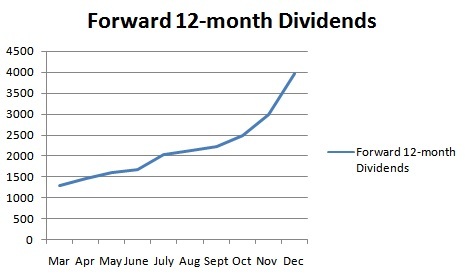 My original goal was to hit $2000 in forward 12-month dividends by the end of the year when I started this blog. My original goals post from March can be found here. I blew plast this number and hit the mark of $3954.05 in forward dividends. I mentioned this in my monthly review. I’ve set more aggressively dividend goals going forward. These can be found on the Goals tab. My new dividend goal for 2013 is $6500 in forward dividends by the end of the year. In order to hit this mark I will need to contribute $67,892 in new capital purchasing stocks that will yield on average 3.75%. This is an average contribution of $5657.67 per month. I think this will be achievable. I’ve been overpaying about 8K/month for the last 5 months to pay off a second lien on my primary residence. I will have this completely paid off by the second week in February eliminating a $380.35 monthly payment. The main reason I did this was that the second lien had a much higher interest rate of over 6%. I also plan to refinance my primary residence if rates are at 3% around the summer. My 1st lien on my primary residence is at 4.25%. I plan to start overpaying to reduce the loan balance so that it’s a conforming loan. Basically I have to bring the loan balance to $417k ( I need to overpay about $20k to do this) so I don’t need a Jumbo loan. By doing this I’ll have over 20% equity into my home and I’ll be able to get the best rates possible. At 3% conforming vs my 4.25% loan now I’d be saving another $407/month P&I. My next plan would be to pay off the condo that’s at 4.5%. However, I would not start doing this until I have my DG portfolio at the same size as the equity I have in real estate. I have apporximately 150k but will have 170k in equity once I refinance my primary residence. I’ll need to bring my DG portfolio up over 70k in value. So this may not happen until 2014. I underestimated my contributions but have adjusted my new dividend goals. I plan to aggressively add to my DG portfolio until the value equals the value I have in real estate equity. My plan is to earn half of my income from real estate and half from equities. I’ve taken a huge step this year in the direction of FI. I sacrificed about 2 years of making next to nothing to start my business. I haven’t mentioned this before but in 2008 I quit my job in sales making around 100k to start my own business. This happened to coincide with the Great Recession. I lost money the first year and I barley broke even the second and made about 50k the third. This obviously ate into my savings. Since then I’ve more than doubled my income every year. While I don’t think it will continue at that pace, I would expect growth of at least 20% a year. I also plan to take a better look at my finances. I will be looking into mint.com to track expenses and may add a new tab for “Net Worth.” I want to get better at budgeting my money and eliminating unneeded expenses. The first four months of this year will be slower with purchases since I’ll have to save some money for a tax bill due in April. I hope everyone meets and exceeds their goals for 2013! Congratulations on a great year! You plowed a lot of money into your portfolio and nicely built up your forward 12-month dividends. Your goals are ambitious but I have a feeling you are capable of achieving them. Best wishes for your investing, real estate, and everything else in 2013! Thanks DGM. I look forward to seeing your trades in 2013 and hope you meet or exceed all of your goals. You’ve done a great job in building your dividend stream. Keep at it. I’ve thought about the half equities half real estate approach too. So far, I’m not impressed by the real estate in my area and I have little desire to be a landlord and deal with people. I’m still trying to study up on it. But my current opinion is to stick with equities for now. Also, you’ve got my sympathies for starting a business in 2008. Great job hanging in there and growing your business into profitability. Thanks for stopping by and I appreciate the encouragement. So far it’s working out ok. I’m making a decent return on what I have invested. As long as my ROI is high enough to justify it then I will add more properties in the future. I have no plans to add any new properties in 2013 however. It was the hardest thing I’ve probably ever done and most people may have just quit. I’ve always been persistent and determined not to fail at whatever I do. Good luck meeting your goals also, the site is coming along nicely. Keep up the great work. You’re well on your way to hitting that $6,500 forward dividend mark by the end of the year. I don’t anticipate hitting numbers like that for at least a few years, but I’ll sure be stopping by for some inspiration! Thanks for commenting. I think your blog may have been the first DG blog I ever started reading and a big part of my early motivation and inspiration for DG investing. I hope you meet all of your goals in 2013. You are well on your way to FI. It’s been great following your blog AAI and seeing your development! What helps make you such a positive role model is the fact that you set goals. Those who never set goals and fail to plan, simply plan to fail. Keep up your good work with the real estate and dg portfolios. I appreciate you following along. Initially the site was a way to keep myself honest and persistent about my investments. It’s nice to get feedback and ideas from others. I’m happy that it’s been motivation for some people. I will be watching your blog for updates as well. Good luck with your rentals, you are doing a great job yourself! You had a pretty ridiculous year, killing it on your investing, forward dividends and paying off the second lien. The mistakes aren’t the worst thing that could happen as long as you learn something from it, you still made up for those 2 mistakes with everyone else that you beat during 2012. Great work and have a great 2013! I did have a better year than I expected. I also set some higher goals for myself in 2013. The search for higher yields caused me to lose some money, I need to just stick to traditional DG investing and some basic options trades. I will have a speculative play every once in a while though. You’ve set some nice goals yourself and I look forward to watching your updates. These are great results. I am also interested in reviewing your options trades since I am totally into trading options alongside with my dividend growth stocks. Great results having 21 trades and bring home 2.7k that is something! At least to me since I am at the beginning of this journey. Thanks! I’ll have to keep an eye on your options trades as I’m still fairly new and always looking for ideas. I also just posted a new options trade now at the top of the page on WM. You can find all of my options trades for last year in the options review, I posted a link above. Hopefully it is helpful to some people.